Misc. Z Parts for Sale. 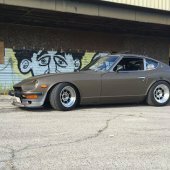 Assume all parts are from my 1978 280z unless started otherwise. All parts are used (except for a few as stated) and priced well below cost to me but open to BO or package deals…can provide more pictures of specific parts if an email address is provided. See link for available pic’s…will be loading up the remainder by this weekend. Do not hesitate to contact me via cell or PM. I noticed the washer fluid bottle and undertray in your albums. Are those for sale as well? Please let me know if got any update wrong or if I missed anyone. I will get you a quote ASAP. you've got a PM for the steering wheel, emblems, abs coupler. All shipped for $36.45 via FedEx! Do you happen to have any valve cover vent hoses? I'm not looking for the hose per se, but the flame arrestor (looks like brass wire brush) inside the hose. Sorry for the delay but no longer have the car..
would you happen to have a 5 speed shift knob with red insert. Just a wish list for me. Thanks for just reading.